What better song than Lara's Theme for a keepsake musical jewelry box. Originally written in 1965 for the film Dr. Zhivago, it later became the basis for the song Somewhere My Love (recorded in 1966). When the lid of this beautiful wooden musical jewelry box is lifted, the romantic music plays. I said "someday whenever that Spring breaks through"
Godspeed, my love, till you are mine again! Traveling with jewelry can be challenging if you don't have a proper way to store and carry your jewelry. 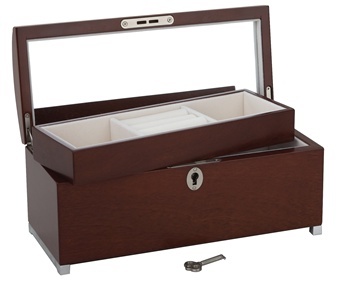 The best way to keep your jewelry safe and tangle free is in a storage case that provides individual compartments, ring rolls and earring storage. This leather jewelry wallet provides just what is needed for secure jewelry travel and being able to personalize it is an added bonus! With it's sleek design, it fits easily into a carry on suitcase and is a space saving alternative to the traditional travel jewelry box. It also makes a unique gift idea for bridesmaids or a special keepsake gift for honeymoon or anniversary trips. 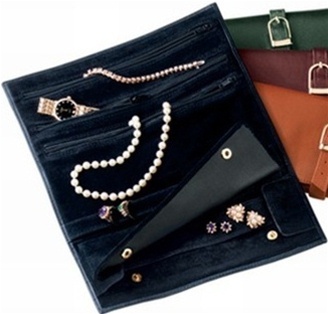 Available in 6 colors, our jewelry travel wallet provides just what you need to travel with your favorite jewelry and accessories in style. Black or Tan $48.95, Carnation Pink, Blue Ocean, Lime Green and Wildberry - on sale for a limited time $39.95. Personalize with up to 3 initials or a single name. Chances are you know someone getting married or having an anniversary. Perhaps you are celebrating with your own wedding or anniversary! The tradition of giving specific anniversary gifts based on the number of years a couple has been married dates back to the Middle Ages. Below is a quick list guide to both the Traditional Gifts and Modern Gifts for Anniversaries. A Jewelry Box makes a treasured anniversary gift. 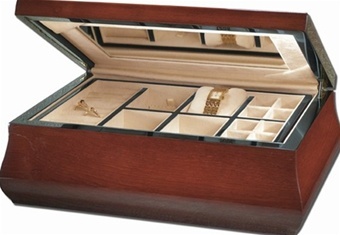 After giving her years of special jewelry pieces, there's no better gift than a beautiful jewelry box to store them in. With ring rolls, a watch pillow and divided jewelry storage, the top tray lifts out to reveal more storage underneath for bracelets and pearls. Measures 13 1/2 x 9 x 4 1/2. Features include piano finish, compass hinges and mitered corners. 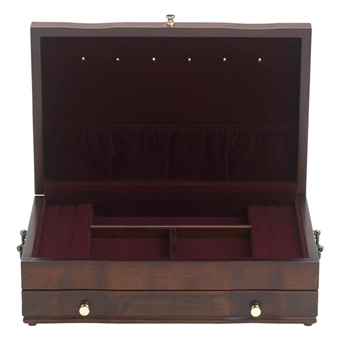 The beautiful grain and high durability of teak make this luxury jewelry box destined to become a family heirloom! Jewelry boxes for little girls come in a variety of whimsical designs with dancing figurines, but what's available for girls ages 10 and up? Girls this age are just beginning to collect jewelry to go with different outfits and want something a bit more spacious and grown up than the ballerina jewelry box they loved when they were five. Our earring jewelry boxes are available in both white and espresso and are a perfect choice for tween girls in this age group. 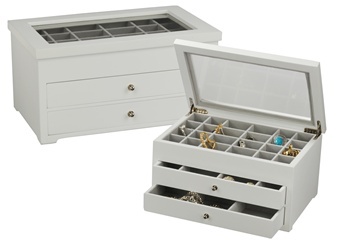 With 24 compartments on top, 16 compartments in drawer one and 6 compartments in drawer two, there's plenty of space in this jewelry box to assist her in keeping her jewelry organized and offers room to add more over the years. Crafted of wood and available in two color choices, this box suits all personalities and matches decor from classic to contemporary. 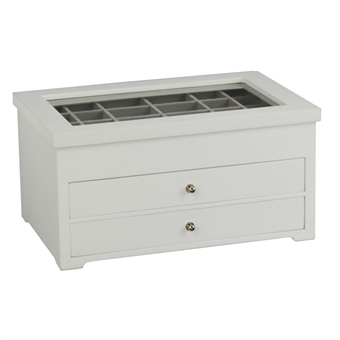 $99.95 This jewelry box ships from CA and qualifies for Free US Shipping. Wedding gifts come in all shapes and sizes and finding the perfect gift can be challenging. 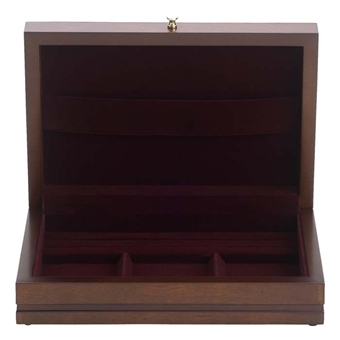 Have you considered his and her jewelry boxes for that special couple getting married soon? Jewelry is often a favorite gift among couples and providing them with a beautiful way to store it can be a very meaningful gift. Women have special jewelry collected over the years and men appreciate a way to keep their accessories organized. Use coupon code SAVE20 for $20 off your order when you purchase these two styles. Do you know a student headed for life in a dorm room? 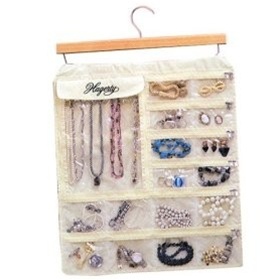 Help her keep her favorite jewelry tidy and within reach in our hanging jewelry organizer by Hagerty. With 35 pockets on dual sides, this organizer provides a space saving solution for all kinds of jewelry and accessories and takes up very little space hanging in a closet. Individual zippered sections keep jewelry dust free and tangle free. Does your college student have an endless collection of fashion accessories? Consider more than one for a tidy solution to jewelry storage in the dorm. Size: 18.5" wide x 21.5" high. Receive a free jewelry care cloth with your order! Select Free Gift on the final check out page.